Home » Evidence » A court won’t force a plaintiff to give “consent”. A court won’t force a plaintiff to give “consent”. 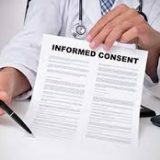 On June 27, 2016, a master of the BC Supreme Court found that it is not appropriate for a Court to order a plaintiff to sign a consent form when attending a court ordered independent medical exam.